Axe favored by brigands of a distant land. 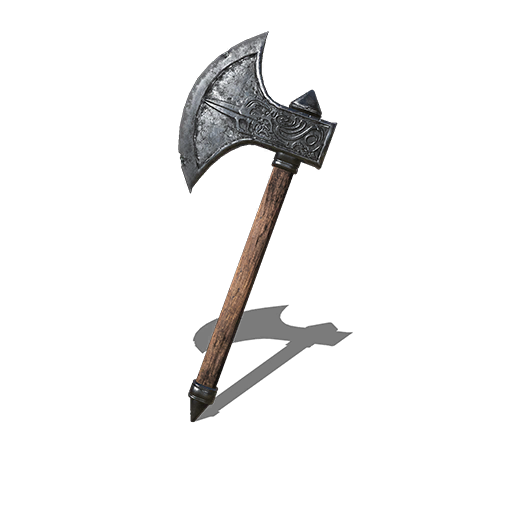 Surprisingly sturdy battle axe that requires more strength to wield than a standard axe. Let out a spirited warcry that temporarily boosts attack. Found on a corpse behind the Unkindled Butcher in Road of Sacrifices, in the area between the Road of Sacrifices bonfire and the Halfway Fortress bonfire. Reduces STR and DEX scaling. Confers wielder slow health regeneration. Adds INT and FTH scaling. Adds slow FP regeneration for wielder. Equalizes STR and DEX scaling.